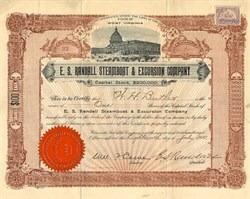 Beautifully engraved certificate from the E.S.Randall Steamboat & Excursion Company issued in 1900. This historic document has an ornate border around it with a vignette of the capitol. This item has the signatures of the Company's President, E.S. Randall (Estelle Randall) and Secretary and is over 108 years old. The E.S. Randall Potomac River Line Company operated steamers on the Potomac River. One of the largest and most magnificent Steamer was the Estelle Randall, named after the company's founder. The 112 foot long vessel was built in 1898 at Baltimore by William E. Woodall and Company. Its machinery was furnished by the Campbell and Zell Company. In 1909, the steamer had been bought by the Farmers' and Merchants' Line of North Carolina and was then overhauled in Norfolk for use in the Albemarle region. Soon after, on January 18, 1910, the Estelle Randall was consumed by the fire of unknown origin and was a total loss. The Estelle Randall made stops at towns along the Albemarle Sound on its run between Elizabeth City and Norfolk, Virginia. During one of these stops at the town of Columbia in Tyrrell County, the Estelle Randall burned and sank while tied to the wharf. The ship's cook died, but the remaining fourteen crew members narrowly escaped the late evening fire. The beginning of the last quarter of the nineteenth century found most of the water transportation business of Washington in the hands of four companies; the Inland and Seaboard Coasting Company, the Clyde Line, the Washington Steamboat Company, Ltd., and the Potomac Steamboat Company. The Inland and Seaboard Coasting Company continued for a number of years to operate the John Gibson and E. C. Knight on the New York run. The Knight was sunk in collision with a schooner off Hog Island in 1883, and the Gibson was sold when the line was abandoned in the following year. This company continued to operate the Lady of the Lake and Jane Mosely on the run to Norfolk until 1892, when the advent of the more modern steamers of the Norfolk and Washington Steamboat Company forced the older vessels off the route. The Inland and Seaboard Coasting Company built the John W. Thompson, named after its first President, about 1878, and placed her on the run to the lower river landings. After the breaking up of the company she was sold to E. S. Randall and her named changed to the Harry Randall. The Clyde Line started about 1876 with the small side-wheel steamer Sue on the run between Washington and Baltimore, with stops at the lower river landings. About 1887 the Sue was bought by Charles Lewis, who for some time had been operating the John E. Taggart on the same run, and who in October, 1894, sold out to the Weems Line, which at once replaced the Taggart with the iron screw steamer Potomac. This line in 1900 replaced the Sue with the screw boat Northumberland; in 1902 it replaced the Potomac with the Calvert; and in 1905, it replaced the Calvert with the Anne Arundel. In 1907 the line was purchased by the Maryland. Delaware and Virginia Railway Company, which replaced the Anne Arundel with the Three Rivers. In 1878 the Express, which was operated by a rival of the Clyde Line was wrecked in a storm on Chesapeake Bay, near the mouth of the river, with the loss of several lives. The Washington Steamboat Company operated the Wakefield and T. V. Arrowsmith on the lower river route from 1878 to 1895, when these boats were acquired by the Randall Line, which added to the fleet the former John W. Thompson, re-named the Harry Randall. In 1906 the line was bought by the Chesapeake and Potomac Steamboat Company which has since continued to operate it on the old run, to the lower river, and which changed the name of the Harry Randall to the Capital City. 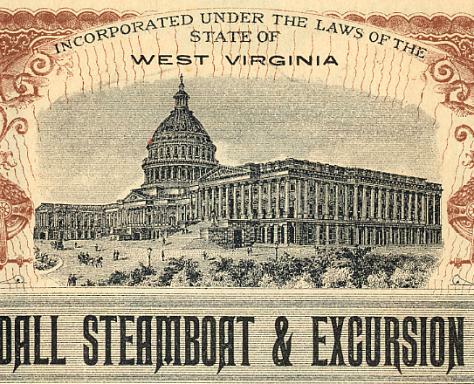 The Potomac Steamboat Company under the management of George E. Mattingly operated the George Leary and Excelsior between Washington and Norfolk from about 1876 until March, 1891, when the line was taken over by the Norfolk and Washington Steamboat Company. The Excelsior had been built to ferry cars to the Richmond and Frcdericksburg Railway terminus at Aquia Creek; and after the construction of the track from that terminus to Quantico, on the Potomac, was used to carry passengers from Washington to Quantico until the construction of the railroad from that place to Alexandria in 1872 completed the through rail connection between Washington and Richmond. She was exceptionally fast, with double boilers and a superstructure so high as to completely hide her walking beam. The Norfolk and Washington Steamboat Company commenced operations in the Spring of 1891 with the palatial screw steamers Washington and Norfolk, to which in 1895 was added a larger boat, the Newport News, and in 1905 and 1912, respectively, the still larger vessels Southland and Northland. This line since its inauguration has been under the management of Mr. D. J. Callahan, with Mr. E. B. Bowling as General Agent. The steamer W. W. Corcoran commenced making trips to Mount Vernon about 1870, and continued to do so until replaced by the Charles Macalester in 1890. She was burned at her dock in September, 1891. About 1876, and for some years after, the Arrow, a small fast steamer, also took excursions to Mount Vernon. The Mary Washington, a flat-bottomed steamer, equipped with a centerboard, was operated by E. S. Randall as an excursion boat to White House and Occoquon from about 1873 to 1882. In the early eighties Mr. E. S. Randall commenced running the Pilot Boy on excursions to River View, later adding the Samuel J. Pentz and Harry Randall. During the late nineties the Ma. calester was aided on the Mount Vernon and Marshall Hall run by the River Queen, a fast ante-bellum boat, which had been used as a transport during the Civil War, and on which President Lincoln made his visit to the Union Army in front of Petersburg in 1865. After being used on the Marshall Hall run for several years the River Queen was employed for a number of seasons in carrying colored excursions to Notley Hall and Glymont. Colonial Beach was established as a summer resort during the late eighties, since which time a number of steamers have been engaged in the extensive excursion traffic to that place; among them the T. V. Arrowsmith, the Jane Mosely, the Harry Randall, and since 1906, the St. John's of the Chesapeake and Potomac Line.